Now You See Me’s initial trailer did not win me over. I thought it made the film seem outlandish. Apparently, I’m the only person on the planet that brushed it off, however, as our Rotten Watch predicted good reviews and the film went on to do well at the box office. As it turns out, I was wrong about Now You See Me. It's a fun ride for moviegoers and should be worth a second whirl when it hits Blu-ray, DVD, and VOD on September 3, with an early Digital window on August 30. Woody Harrelson, Isla Fisher, Dave Franco, and Jesse Eisenberg star in the film, which follows four magicians who combine forces to put on a series of shows in which they commit confounding crimes and stump the police department. Sometimes a great ensemble cast ends up bogging down a film with added plotlines (see other Lionsgate movie The Big Wedding), but for other stories, a nicely honed ensemble cast can make a fun summer movie stand out from the pack a little more. Now You See Me is most definitely an example of the latter case, as it even employs a slew of side actors like Mark Ruffalo, Morgan Freeman and Michael Caine, all of whom contribute to the plot. Lionsgate Home Entertainment is putting together the set, which doesn’t seem to be bogged down with too many extras. 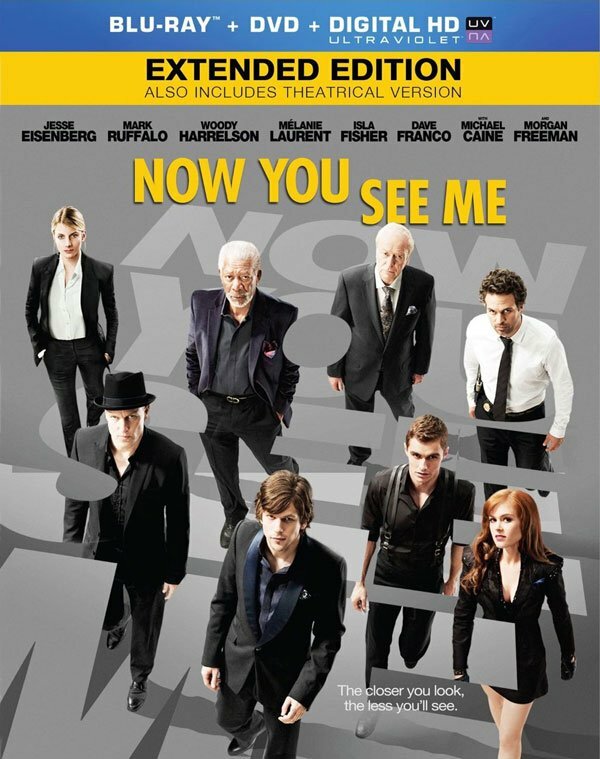 There are a couple of things I am excited for with the Now You See Me Blu-ray, though, the first of which is the cover art. The second is the sixteen minutes of extra footage director Louis Leterrier included with the extended cut of the film. The bad news is the extended cut of the film will only be available with the Blu-ray copies of the movie, which list at $39.99, although Amazon has it available for pre-order at a sale price. DVD copies will come with a few extras, too, although those are a little more scarce. You can check out the full list, below, but first, here’s that trailer for the film. Yup, still probably wouldn’t have seen this movie if my husband hadn’t dragged me a long, although I’m still glad I did.